Perry Block - Nouveau Old, Formerly Cute: Next on Nova: Whatever Happened to the Dinosaurs? 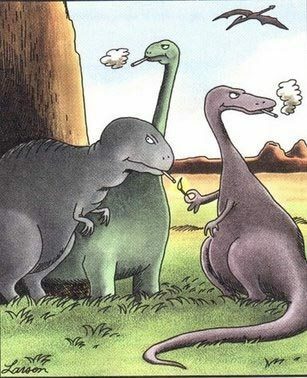 Is this what really happened to the dinosaurs? They rule our imagination – those thunderous beasts who ruled the earth over 65 million years ago. For years scientists have struggled to determine just what caused them to go extinct. It’s Whatever Happened to the Dinosaurs? On Nova…. Perhaps it was an early case of global warming. Or the impact of a gigantic meteor that careened out of control and crashed into the earth at a time when there were no strict rules against careening out of control and crashing into the earth. Or was it simply an appalling lack of concern for eating heart healthy? What did in the dinosaurs? Today modern science is learning that all these various theories may amount to little more than paleontological poppycock, if we can use that expression on PBS without jeopardizing our federal funding. Today’s paleontologists --- and we mean the really smart ones that listen to NPR --- are coming to the startling conclusion that dinosaurs did not go extinct at all, but simply became passé! This is Dr. Lance Lewitsky of the University of Havertown PA. He has been studying dinosaurs for over 25 years, ever since he learned that there was no math involved. “Our fossil record is woefully and highly incomplete. In fact, I’ve given our fossil record an Incomplete with just one week to make up the credit or get an F! There is no proof whatsoever for the theory of dinosaur extinction other than our desire that it happen today to certain members of the Republican Party. High in the Peruvian mountains Professor Samantha Earthy, a more attractive than you’d expect colleague of Drs. Lewitsky and Potchka, is supervising the excavation of molars from the mouths of some indigenous cash-strapped locals. Dr. Earthy often accompanies Dr. Letwitsky on paleontological digs when he can secure sufficient funding for her participation and convince his wife she actually has a college degree. Well, realizing their time was regularly being beaten by the much cuter mammals, that’s precisely what the highly embarrassed dinosaurs of 65 million years ago opted to do. But if the supposition of Professors Lewitsky, Potchka, and Earthy is accurate that dinosaurs yet survive today, where are they? Why don’t we see them? Why don’t they eat us, especially those of us who smell good? One school of thought is that we actually do encounter dinosaurs all the time, but they are so lacking in cool that we look right through them! And many today assert that Democratic political strategist James Carville is in fact a highly evolved velociraptor, an assertion which Republican political strategist Mary Matalin has never denied. And so, the battle lines are drawn. On one side the traditionalist paleontologists who contend that dinosaurs are indeed extinct and if you were to encounter one today, you’d run like the dickens, if we can use that expression on PBS without jeopardizing our federal funding. On the other side lie the cutting edge views of Professors Lewitsky, Earthy, and Potchka which hold that you may very well come face to face with a dinosaur one of these days, and if it should happen, you’d hardly run. You’d give him his noogies. Next Time on Nova: New discoveries all but verify the legitimacy of String Theory and of a parallel world in which conservatives have control over the National Endowment of the Arts and NPR consists solely of 24/7 broadcasts of Car Talk. Wow, Mr. Nova Narrator, you had me at the Gary Larson cartoon of smokin' dinos! But you kept me laughing through the entire broadcast. PBS has come a long, long way, baby! Wait--PBS... Public Broadcasting System or Perry Block Snarchasm? Loved this broadcast in its uninterrupted entirety, Perry! Thank you for your pledge, Ann Mauren! It's viewers like you that allow us to continue to bring you lame parodies like these without commercial interruption. Your safari shirt is on its way and is being delivered in person by David McCullough! Yes, Mr. McCullough will expect you to model it. Yes, there is another side to our mainstay two-time Pulitzer Prize winning historian. Hey, David, knock it off! Be more PBS!